First, let me apologize for disappearing for so long. Anyone following my blog knows that the past three years have been hell since losing Mom. Let me tell you, it got worse – much worse – before it got better. But THAT story will be for another blog. (It’s a very important one.) I am happy to report that I can FINALLY say with some confidence that I am better. I will never be the same, of course, but I am as close as I will be able to get. And that’s a positive thing! I’ve decided to share one of my ‘adapted’ recipes. Not to get too personal here, but we all like to be as clean as we can be leaving the bathroom. There are many different kinds of wipes that you can buy; some are flushable, some are not. There are also many blogs about whether the flushable ones are really a good idea or not. You can read a couple here: Is It Ok to Flush Those Wet Wipes? and Why Flushable Wipes Aren’t Really Flushable. As always, if you’re interested in learning more, do a quick search on Google. Anyway, when I found this recipe for homemade baby wipes HERE, I was excited to try them, however, I didn’t particularly like the paper towel bit. Instead of being able to flush them, they’d have to go in the garbage, and that didn’t appeal to me, either. As I was looking through my bathroom cabinets, I saw that I had little spray bottles, and then I got an idea. Why not make the liquid part and store in the spray bottle so I could just spray on some toilet paper when necessary? I liked that idea much better. And after I tried it, I loved it. I’ve been using this for years. This mix also has way less chemicals then store bought ones, and that’s ALWAYS a plus! Measure out ingredients and mix everything in a bowl. 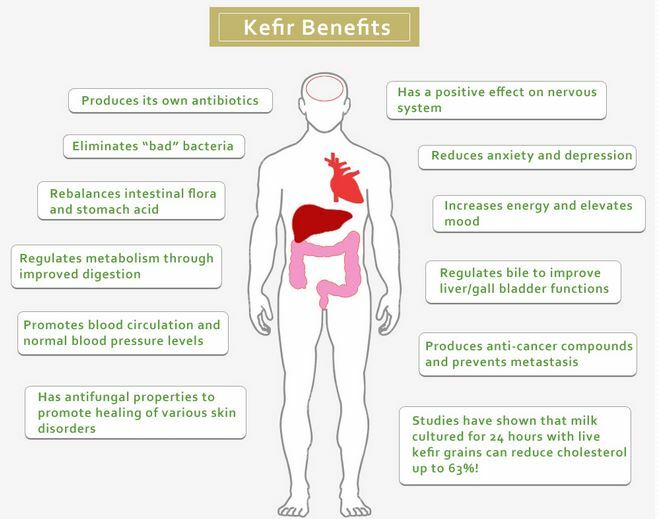 Kefir is a live bacteria culture that’s normally used to create a fermented dairy beverage. The grains are normally harvested from goat, sheep, or cow’s milk. Aside from a combination of lactic acid, lipids, sugars, and protein, kefir grains are also rich in cultured bacteria and yeasts. It’s widely known that kefir is a significant source of friendly bacteria that aids the digestive system in its processes. The origins of kefir can be traced to the Eastern European Caucasus Mountains, where the name means “good feeling”. 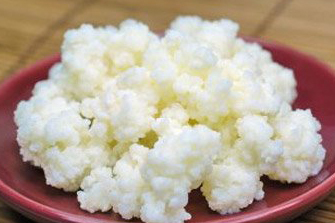 Kefir has a naturally sweet and slightly sour taste, and it has a consistency similar to yogurt. The refreshing taste makes it easier for people to include kefir in their diets, and you can enjoy it in more ways than one. You can start with a cooling kefir milk drink. There are a lot of people who say that kefir is best consumed as a beverage in a tall glass with some ice. Since it already has some sweetness, there’s really no need to add any sugar. You can try blending the kefir milk or water with some fruits and turn it into a healthy smoothie pick-me-up, as well. For kefir milk shakes, add a scoop of your favorite ice cream and some ice before blending. Top this off with some whipped cream. Kefir can also be used instead of milk when making homemade ice cream. Not only will it be tastier, but it will be much healthier, too. Try it with natural vanilla, too—you’ll go nuts! For a lighter dessert, you can even make some kefir popsicles using ice trays and toothpicks. A little dollop of plain kefir can make soups refreshing but hearty. Try adding it to borscht or tomato cream soup. And don’t stop there: why don’t you spread some thick kefir onto toasted bread while you’re at it? It’s actually a good substitute for cream cheese. When it comes to the bread, if you make your own loaves at home, kefir can also be used in the baking process. Reduce the amount of water and eggs that you use in a recipe and add kefir for a loaf that’s more flavorful and moist. It works great with sourdough. Some recommend kefir pancakes, too. This is a great way to enjoy kefir during the most important meal of the day. Kefir scones are worth trying, as well. The best part is that these are quite easy to make! 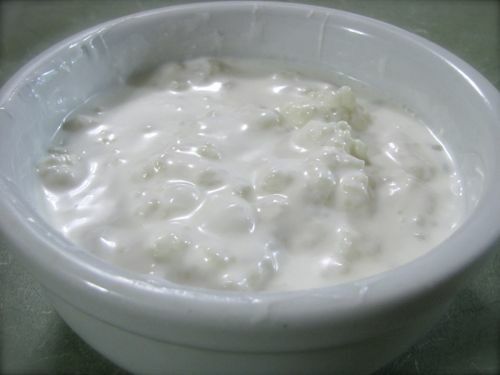 Kefir can also be eaten just like yogurt. It can be consumed plain or with some chopped fruits and nuts. Add granola for an even yummier snack. You can use kefir in veggie dips, too, as it’s a great item to bring on picnics. For those who are a bit more adventurous, give kefir kraut a go during the next family barbecue. Add kefir to some cabbage and caraway seeds, and that’s it! There are definitely at least a dozen ways to enjoy a healthy food like kefir—and probably even more waiting to be discovered. Try out your own kefir experiments, and add the best ones to the list! Two or three years ago, I was at Michael’s one day when they had their silk hanging plants on clearance. 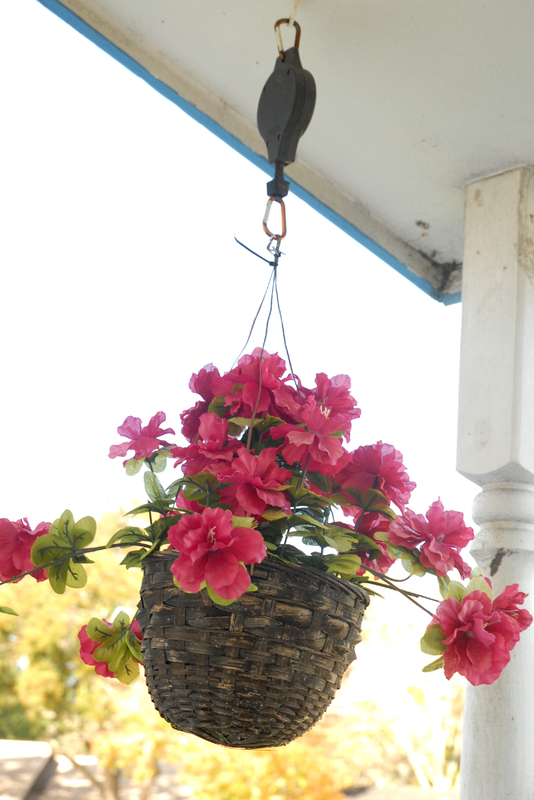 Now, it’s not that I don’t have a green thumb – I’ve always got something growing in the garden – but hanging plants have always been a little harder to maintain for some reason. So I looked at the silk plants and thought that they were quite pretty, and the fact that they required no maintenance was a given. 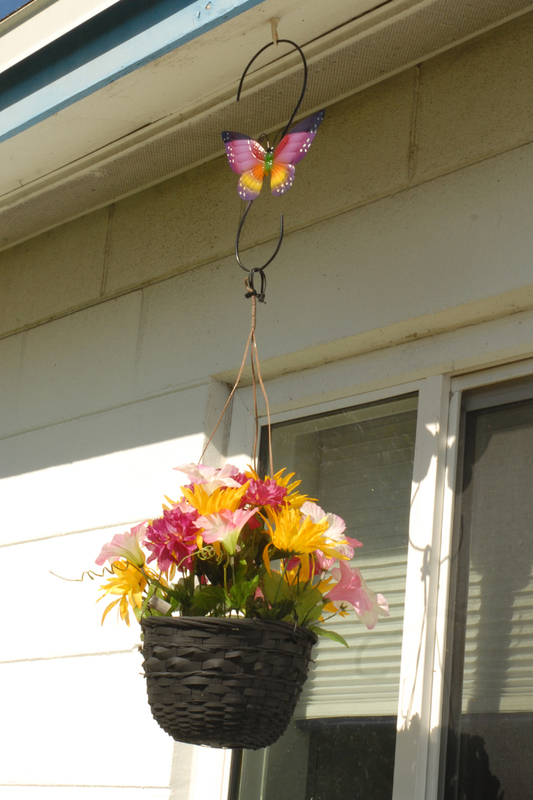 I bought them and hung them up outside – they looked great! Pretty sad, right? Well, being of the frugal, don’t-toss-anything-I-can-reuse mentality, I decided to give them a new life. 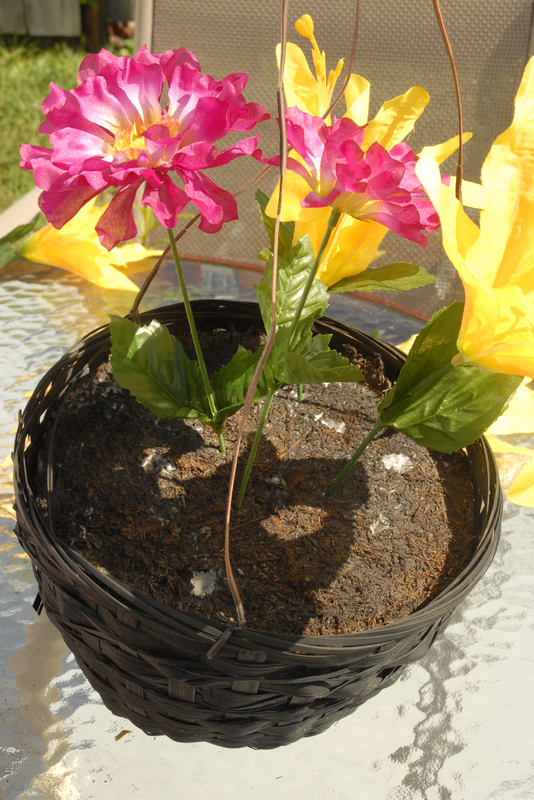 The inside is just styrofoam so after one good yank of the plastic stem, I had a clean slate to work with. First, I gave the base a quick once over with spray paint. Spray paint does wonders for almost everything! Then I headed to the dollar store (one of my favorite places). They always have a section of wall filled with the prettiest silk flowers, so since I had three baskets, I bought three ‘sprigs’ of flowers for each. 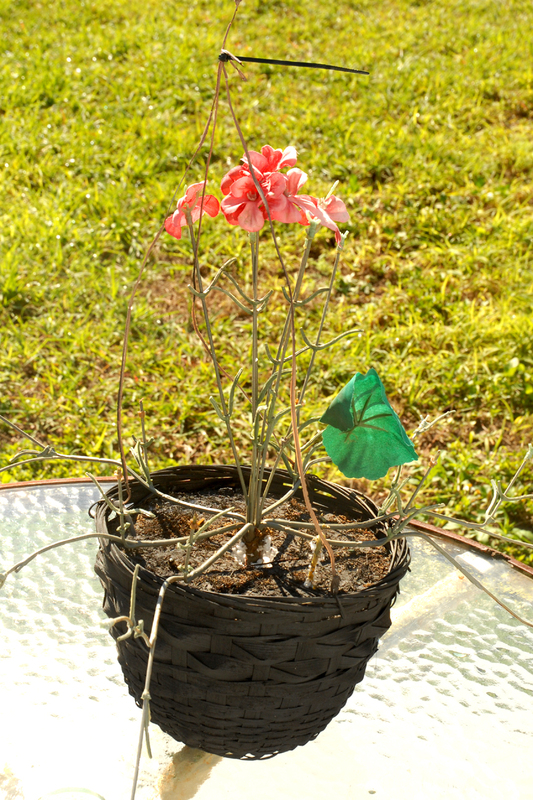 With wire cutters, I snapped off the main stem. 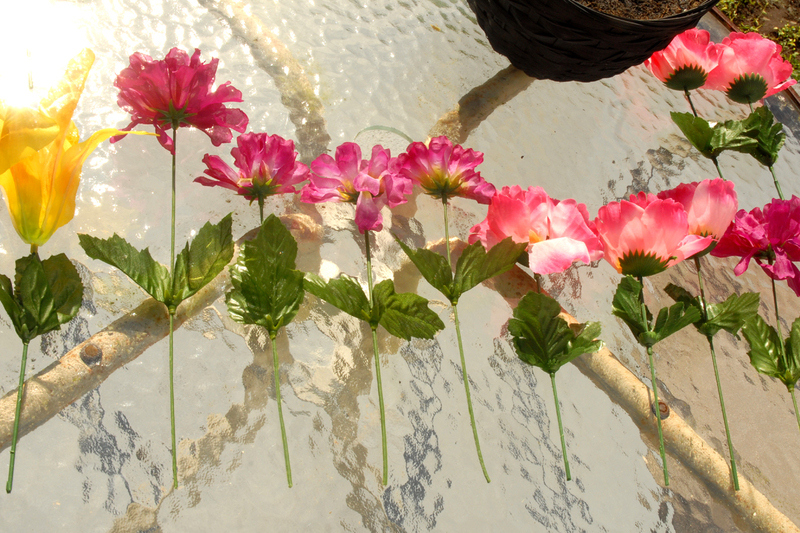 Next, I separated each individual flower and grouped them together by length. The longer ones go in first on the inside with the smaller ones on the outside. Push them firmly into the styrofoam. I didn’t use any, but putting a little glue on the stem when you push it in will help it remain in place. 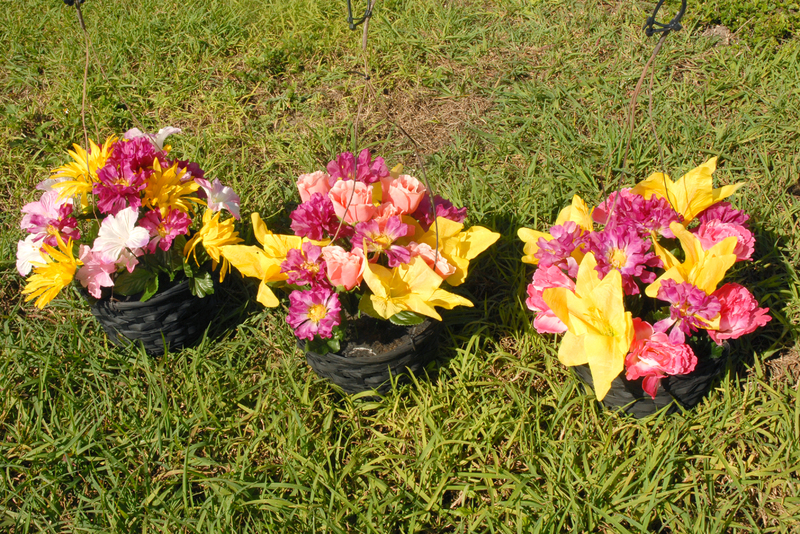 Repeat this process, and in just a few minutes, you’ll have pretty baskets of flowers! I wouldn’t tell Michael’s, but I actually like MY version better! 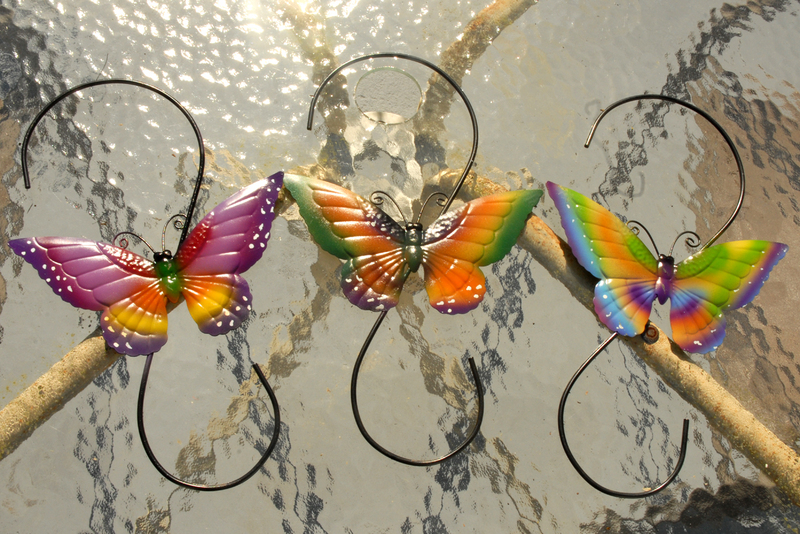 I also picked up new hangers for my baskets at the dollar store, too. Just $1 each! Aren’t they cute? 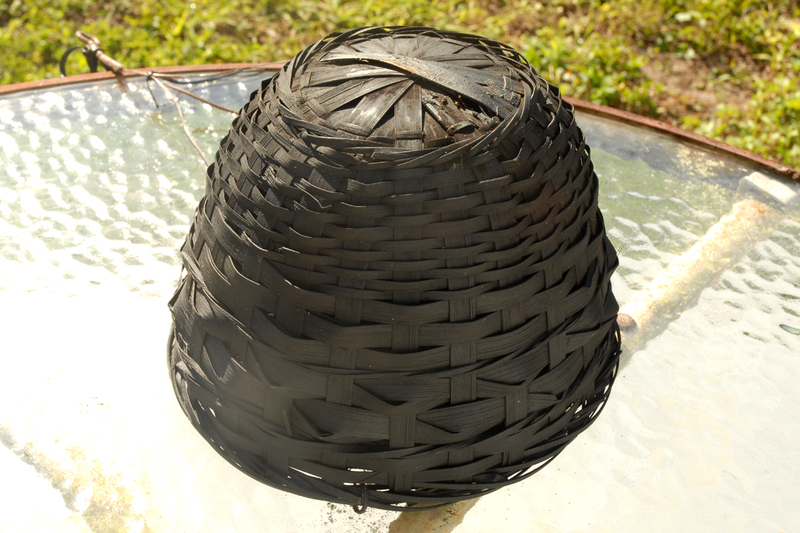 So, if you’ve got old baskets, don’t throw them away. 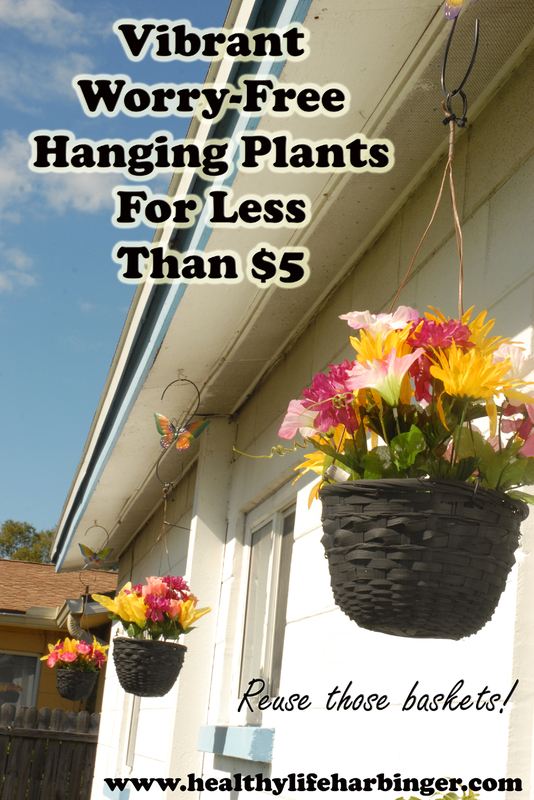 For less than $5 for each one, you can have pretty, stress-free hanging plants and flowers, too! The beginning of the year is always a good time to take inventory around you. Are there projects that you’ve been putting off for months? Is the shed in the backyard bulging at the seams? Perhaps your garage is so cluttered that there’s only a tiny, barely-navigable path through it? Do things fall out of your closets because they’re so full and messy? If you’re like me, the list goes on and on. And I own a craft business, so that automatically doubles my to do list right there. 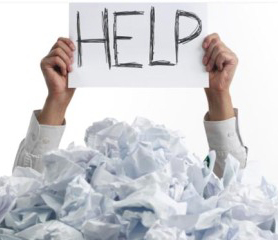 I will admit that having so much to do gets to be overwhelming. In fact, it gets so overwhelming that nothing gets done because I’m too busy being stressed and figuring out where to start to actually start. It’s a vicious cycle. So what do you do? 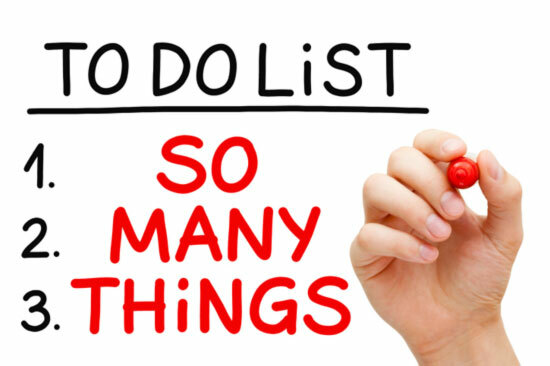 How do you even begin to start when your to do list makes your head spin in circles? This is what I did last year. You can’t read the text, but the text is not important. 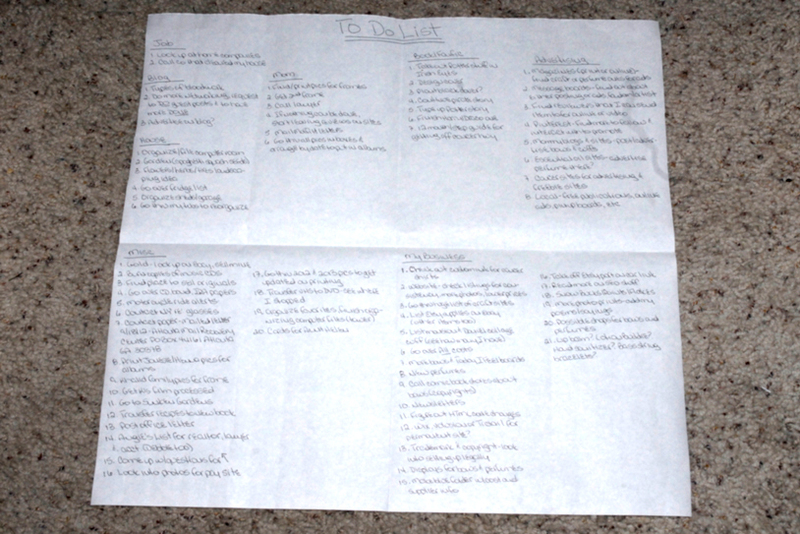 I made a list of everything I needed to do, categorized it and rewrote it so that I could work on it all of last year. I have done the same thing this year, but I added to it. Don’t let the little picture fool you – this piece of paper is 14″ x 14″ square! Step 1 – Make Your List. Grab some paper and a pen and start walking around your house, inside and out. 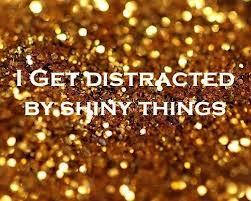 Look around, and write down every single thing you see that needs attention in some way. Pay no mind to whether it’s a ‘big’ project or ‘small’. Look around the yard. Check the sheds. Open the closets and cabinets. Look in the attic/basement. Visit all rooms. Write down everything. Step 2 – Categorize It. Now that you’ve got this ridiculously huge list that is making your eyes cross and head spin just looking at it, you’re going to categorize everything on it, so get some more paper. How you categorize it is up to you. 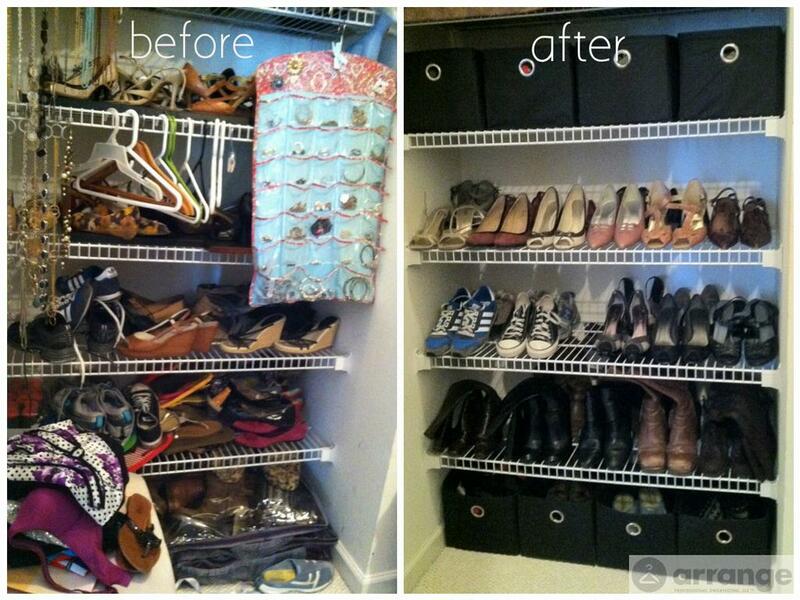 You can do it by room or by function (like cleaning cabinets or organizing closets). Again, ‘big’ or ‘small’ projects are irrelevant here. Just get ‘like’ projects together in a group. Step 3 – Prioritize It. 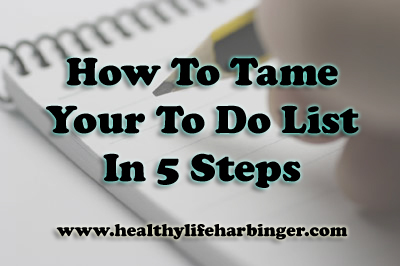 Take each of your categorized lists and prioritize them. (No, this is not called OCD, trust me. This is called making your life easier!) I took my categorized lists and selected the top five most important from each one and put those on a separate list to focus on first. How to choose is up to you. Is there anything financial on your lists? Going over credit card accounts, for example? Might want to make those top priority. Do you know that you’re having guests to your house at some point this year? Do you have anything on your lists with a deadline? Step 4 – Get Simple Things Done First. Go back to your categorized lists. Anything that can be done quickly, do them. When I say ‘quickly’, I mean anything that can be done in under thirty minutes. Why? Because anytime you have a huge to do list, it always makes you feel more motivated when you have items crossed off. You need to keep your head in the game, so to speak, so getting a few things done and off the list will encourage you to keep going. Step 5 – Print and Post. 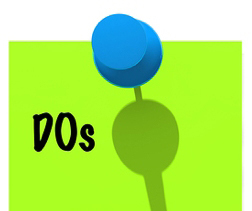 Transfer your lists to whatever form is comfortable for you. I like paper, and I like using pens and pencils. Some people prefer Excel or Word or other computer programs. If you transfer them to something electronic, make sure to print your lists. They need to be out in plain sight where you can see them all the time. If having a big list with a bunch of crossed off items gives you encouragement, do that. If you prefer to delete and reprint so that you’re looking at a progressively shorter list of just those things left to do, go for it. Neither really makes a difference – it all comes back to keeping your head in the game. Do whichever gives you the motivation to continue. You might need to set up an allocation calendar if your lists are super long like mine. My lists will take months – not days or weeks – to complete, so allocating my time seemed to make sense. I was in Michael’s the other day and picked up a 12″ x 12″ calendar from their after Christmas sale for less than fifty cents. Then I went back to my categorized lists. I had six categories that I’d divided everything up into (craft business, writing, errands, garden, cleaning, health blog), so I put them in order of the most important to the least important – my business being most important. Then I went back to the calendar and allocated days for certain categories. Wednesdays are always errand day, so that was a given. Sundays are my racing/football days, so it made sense to divide that into business and story writing day. I wanted to start the week with business goals, so because it was first on my list of importance, it also got Mondays and Tuesdays. Gardening/outside work seemed to fit after the errands on Wednesday since I don’t usually need a full day for those type things. Go through your categories and do the same, allocating more time to the most important one, and work everything around your existing schedule. I understand if you’re working full time and have kids to shuttle around that your time will not be as plentiful, but you can still make this work. Allocating your time will keep you focused and help you get MORE done. If you’re like me, you can walk around all day, stay busy all day and yet not really accomplish (ie: finish) anything. I walk into one room – “oh I meant to do that” – and start on that only to walk into another room – “oh yeah, I was doing that, too – and mess with that for a few minutes. At the end of the day, I’ve done a bit of fifteen different things, but nothing was completed. Are there any other daily/weekly/monthly reminders that you need? Put them on the calendar! Don’t forget to allow yourself some open days, too. And if a day needs to get switched, switch it. Don’t worry about changing up your schedule. You’ll find that after just a couple weeks, your stress will be less, and you will already have a few items crossed off of your to do list. I know MY stress level has been greatly reduced because instead of getting to the end of my day and feeling like I’ve accomplished nothing, I now reach the end of my day and find that I’ve completed quite a bit, and it makes a HUGE difference! I should have done this sooner! Once you’ve cleaned/organized a closet or a room, try the ‘one touch’ method for keeping things clean and tidy. The one touch method means that you touch something only once (or at least as few times as possible). Think about it – you come home and toss your jacket to the couch (first touch). Then later, you toss it to the back of the couch when you want to sit down (second touch). You pick it up again when you’re finally ready to put it away (third touch). You’re moving the jacket around repeatedly when you could have put it away when you got home (one touch). Read more about this here. It’s a GREAT idea! And it makes so much sense! 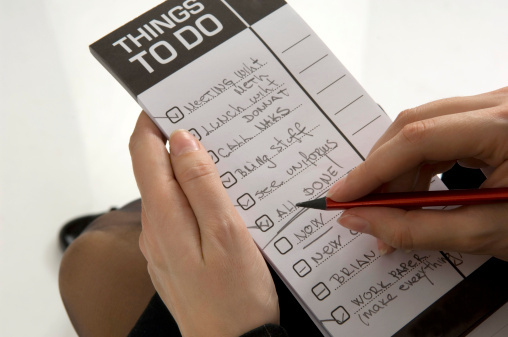 What other ways do you keep yourself motivated and on track with your to do list? Now that it is the end of the year, I think it’s a good time to reflect. 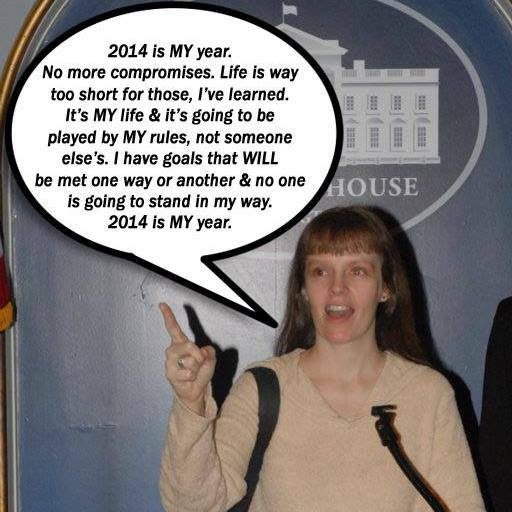 Coming off losing my mom in 2013, I thought I was ready to move on. I thought I’d done my grieving and that it was time to get back to me. My job had been conveniently given to someone else the year before (while I was away at my third family funeral, no less), and I found myself at a bit of a crossroads; did I return to the kind of life I had – being chained to a desk for forty hours a week – or did I use this time in my life as an opportunity to do something else? You see, I’d started an online craft business a few years prior and did fairly well, but as many have discovered before me, you either resign yourself to it as a ‘hobby’ or you turn it into a business. After much thought and consideration, I decided to turn it into a business. I went from a little shop on Etsy to having my own website and newsletter. I already had a Facebook page and Twitter account for it. I had many new items that I wanted to make now that I could devote all of my time to it. And then I discovered what grieving truly was. Anyone who has followed my blog the past couple years knows it’s been a rough time. All of the plans that I had put in motion in January came to a screeching halt in March. I went from being excited, motivated and busy to an empty shell. Getting out of bed was a big accomplishment, though I lost count of how many days (weeks) I spent on the couch not because I was tired or lazy but because I was absolutely incapable of doing anything else. Ever been in a fog? You know, those times when you just can’t concentrate? You know that little voice in your head is reminding you of all the things that you have to do, but no matter how hard you try, you just can’t. And the tears…I’ve cried more in one year than I have in probably the last ten. And I don’t mean crying for a few minutes and being done. Oh no. I mean, lying on the floor, curled up in a ball, sobbing as if I was in physical pain. Repeatedly. Day after day. Week after week. I was in pain – horrible, gut wrenching, ‘my life is over’, emotional pain. I wondered if I was losing it. I wondered if I needed counseling. I wondered if what I was going through was normal. I wondered if it would ever stop because there were so many days when I thought it never would. Honestly, I was growing to hate life. Just when I thought I was ‘getting better’ – when I thought a little sunshine was finally making its way through the storm clouds and I could start functioning normally once more – it would start all over again, and I was pulled down into the abyss whether I wanted to be or not. By June, I was not good company to be around. I was upset and on edge, and one little thing would set me off. I wasn’t happy, and I felt like the entire universe had decided to use me, and only me, as its personal dumping ground. And I was tired of it. June also brought my fortieth birthday. I told myself that since my thirtieth was awful (another whole blog right there), I was going to have a good fortieth come hell or high water. I decided to make reservations out with my boyfriend (we never go out), and I even scheduled an appointment to get some henna done (I love henna designs, and I hadn’t had any in a while). I was determined to have a special day. I was going to make it special one way or another. And then hell came. My dress for our special dinner was out on my bed. The reservations were made. 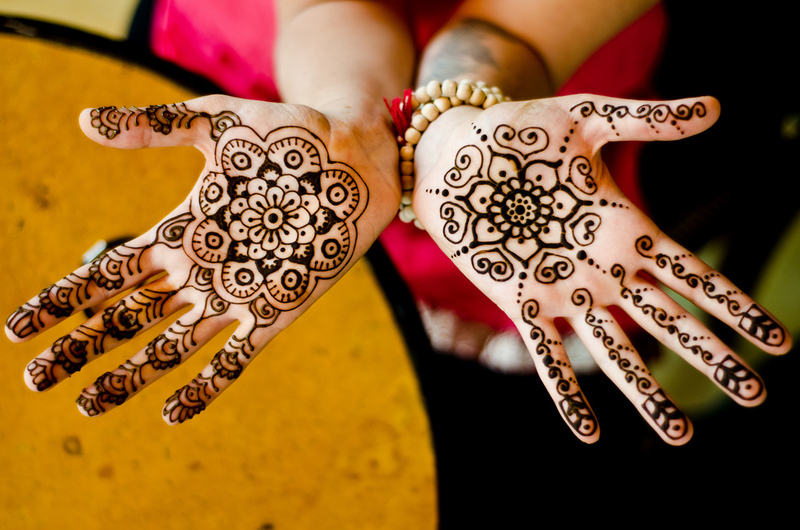 I grabbed my purse and headed out for my henna appointment with somewhat of a smile on my face. I got in the car, put in the key…and nothing. The car wouldn’t start. Now, in reality, that is not a big deal. It’s annoying, but not life ending. To me – given the extremely fragile state I was in – it sent me on a dizzying downward spiral that caused bouts of explosive anger; the kind of anger that just makes you want to destroy everything in sight. I was useless for two weeks. I even deactivated my Facebook account for a day or so because I could not handle any birthday wishes. I didn’t know what I’d done, but I was convinced that the universe hated me and that it was out to get me. Because I needed that on top of everything else I was going through. By July, I was at another crossroads. I’d reached a very bad – very dangerous – place emotionally and mentally, and I knew my next move was going to be monumental to my life. I was ready to give in – to give up everything I believe in and stand for. I felt like the only choice I had was to go find a doctor to give me some ‘happy’ pills and go find another desk job and become like everyone else. And that thought alone made me more angry and more bitter than I already was. Hateful even. There’s nothing wrong with having a regular “9-5” job, but not when you feel like you’re “settling” for it or because you feel like you’re incapable of doing anything else. My thoughts were toxic, and no enemy could have said anything any worse to me than what I was already thinking…what I was telling myself all day every day. It was beyond horrible, and it didn’t take long to start believing it. I was driving home from an errand one day in July when I passed a reiki place. I’d seen it plenty of times, but it stuck in my head that day. 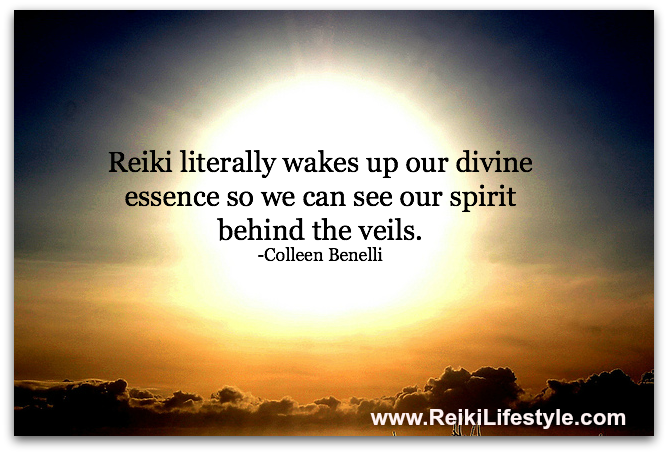 I’d learned about reiki years previous when I lived a more ‘metaphysical’ way of life, and I started thinking that maybe I’d check it out. It was close to home and not expensive. I was so desperate for help – I felt like it was my only chance to break away from the path I found myself on. I knew it was about energy, and I knew mine was not in a good place. Why not try, I thought. What have I got to lose at this point? I already felt like the ‘me’ that I’d known was gone, anyway, and I wasn’t sure if I’d even be able to get her back. I had one thirty minute session, and it was life changing. Truly. No, I certainly hadn’t. I didn’t feel like I had anything to be grateful for after the couple years that I’d had. And feeling like the universe was picking on me and using me for its proverbial litter box didn’t help, either. She told me how important it was to be grateful for big things and small things. She reminded me of how we – and everything in this world – are nothing more than energy. If we’re constantly sending out negative energies and ‘taking’ all the time, we’re not going to create much positive around ourselves. I agreed with everything she said. I’d learned it years ago, after all, but I’d gotten away from that previous mindset. Galaxies away. I told her I would try. And try I did. Every night before going to sleep, I would take a few minutes and ‘send out’ gratitude for things. It’s amazing how the more grateful you are, the more you find to be grateful for. And I started meditating. 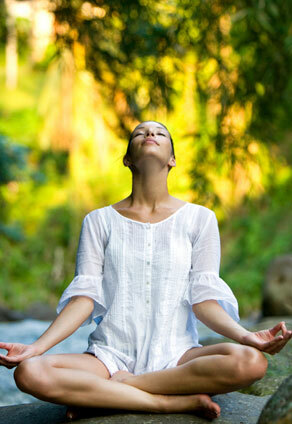 You wouldn’t think that sitting quietly with your own thoughts could be profound, yet it is. My entire year turned around from one decision. And it was noticeable. My boyfriend noticed the difference immediately because my attitude and countenance changed almost overnight. When I went back for a second reiki appointment, the practitioner also noticed immediately that I was different and not wound up ready to explode like I had been previously. It made me feel good. And I hadn’t felt ‘good’ the majority of the year. 2014 was my year in many ways. It was my year to hit rock bottom emotionally so that I would seek out help and be reminded of the path that I should be on; the path that I’d chosen a number of years ago. It was my year to learn that you will always face your darkest days with no shoulder but yours to cry on. It was my year to learn that just because you do nice, thoughtful things for others does not mean it will be reciprocated. It was my year to discover that when someone is too nice, they’re being fake. It was my year to learn how to be nice to myself and to not be so strict with the schedule that I make for myself. It was my year to be honest with myself about my thoughts and feelings, even if they weren’t pretty. It was my year to learn about the devastating tunnel of grief and how to come out of the other side of it still intact and, in some ways, stronger. It was my year to connect with myself again and to remember that I must be grateful for everything every day. We learn with every single experience in our lives, whether ‘good’ or ‘bad’. If you’re not constantly learning, you’re not paying enough attention. And I’m happy to report that I have returned to my initial goal that I had set at the start of the year – to pursue my craft business full time. I am devoting 2015 to doing everything I can to make it successful – I will be setting up at shows and markets all year (something I’ve never done). Whatever happens, I will continue to be grateful. I will continue to learn and grow. And ironically, amidst all of this internal chaos, I’ve learned the secret of being happy. But that’s for another blog. And 2015 will be, too. 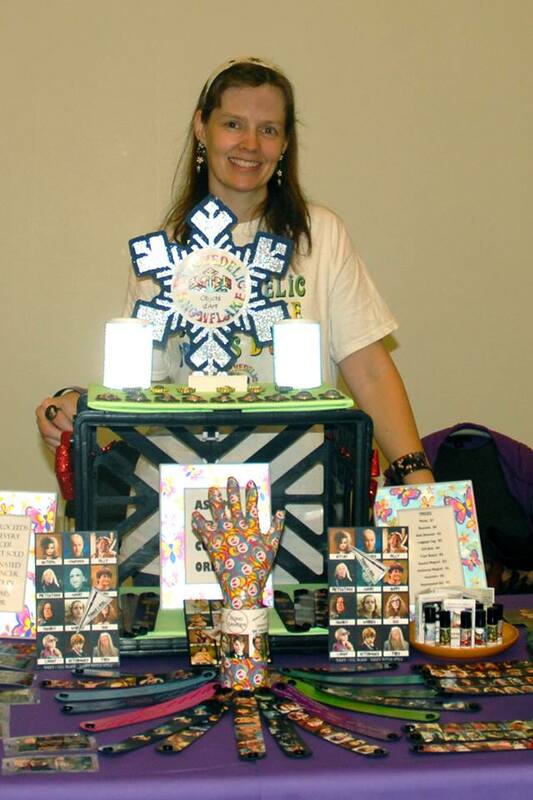 Oh…and in case you’re curious…this is my business: www.psychedelicsnowflake.com. And this is me at my very first show. Hopefully, it’s the start of many! I don’t know about you, but I’m very interested in learning more about where I came from. What countries were my ancestors from? What did they do? Who was the first to come to America? 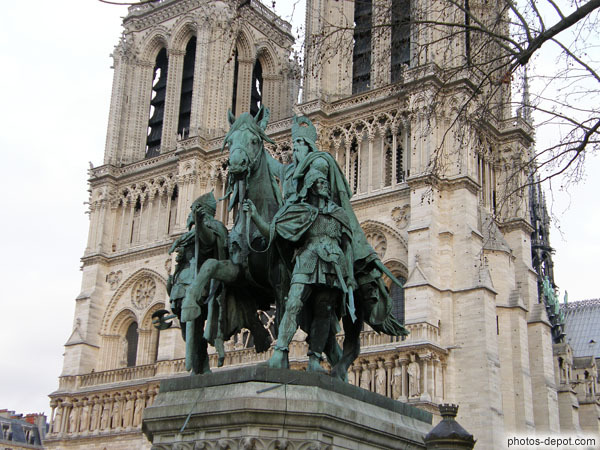 An uncle on my father’s side has traced us all the way back to King Charlemagne – it’s really quite fascinating. I don’t have much on my mother’s side yet, but I do plan to look into that, as well. The following is a guest post from Suzie Kolber about creating a family tree as a gift. No gift could be more personal or have more meaning than a family tree! You may prefer to be more historic in your approach and select a ten or eleven generation family tree template. This option makes for a wonderful gift that will appeal to many people. Just be prepared that the research could take you several months so plan far ahead if this is the approach you choose. Another option is to take smaller templates and create multiple family trees. For instance, you may decide to cover the ancestry of all of the person’s grandparents. You would create four separate templates that could be placed together in a large frame. You would probably select three or four generation templates to ensure that everything fits in the space and isn’t too overwhelming. Bowties and wide or tall trees are other options that are ideal for three or four generations. 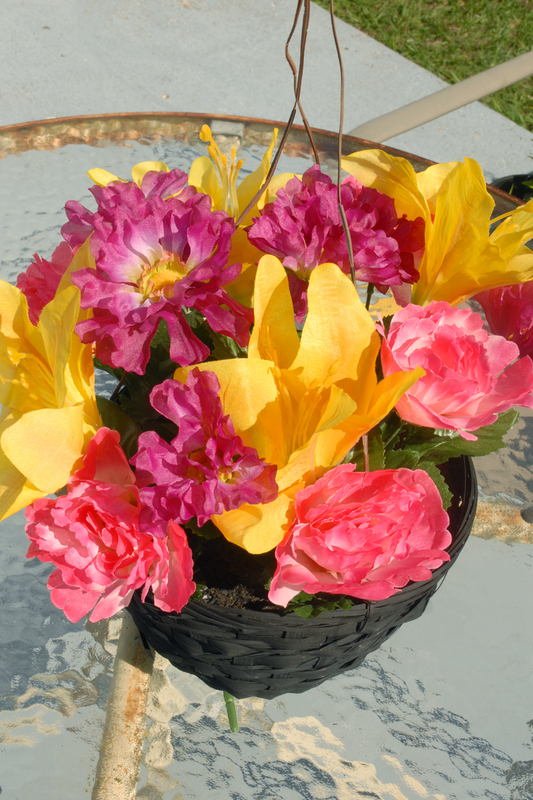 They often allow you to include photos or more information other than just the names to personalize your design. Give the family tree as a wedding or anniversary present, and include both families of the couple on your template. A bowtie design is the ideal choice for this gift and is easy to read. 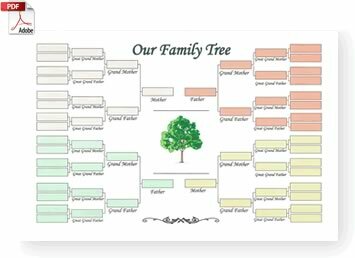 Suzie Kolber created http://obituarieshelp.org/free_printable_blank_family_tree.html to be the complete online resource for “do it yourself” genealogy projects. 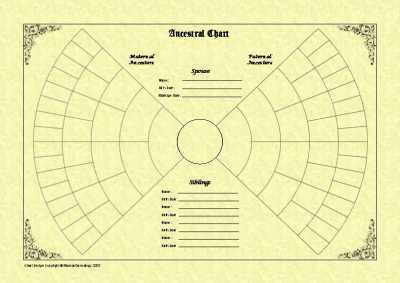 The site offers the largest offering of family tree templates online. The site is a not for profit website dedicated to offering free resources for those that are trying to trace their family history. These greats were 100% correct. Sometimes we must fully experience something before we can fully understand it. 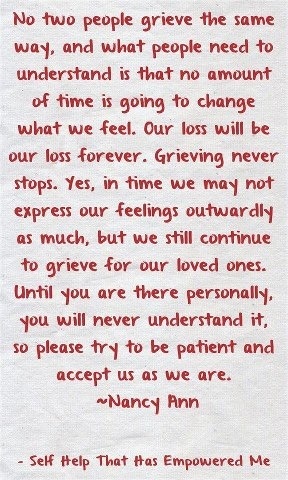 I did not understand grieving until I went through it. No one understands it until they go through it. It’s unlike any other emotional time in life. 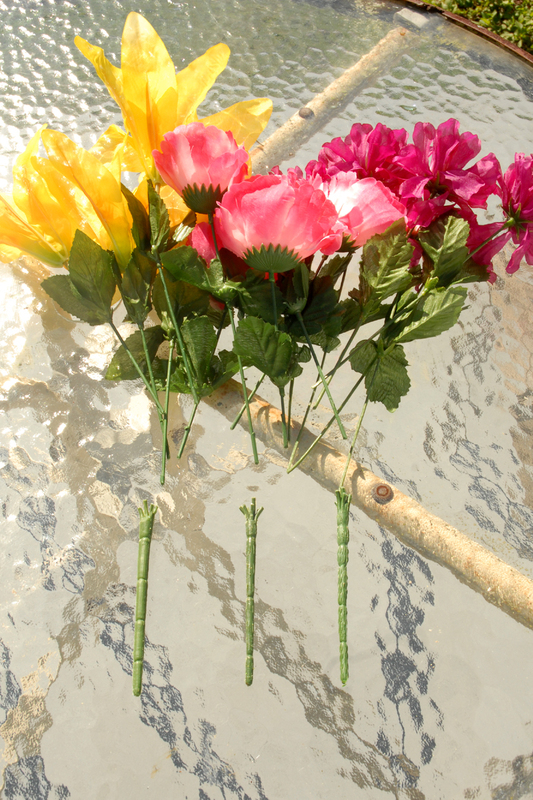 Suppose your best friend’s mother passes away. What do you do? You offer your condolences, tell them to call you if they need anything, you attend the funeral (if you can), repeat your condolences as you hug them and then go home. It’s over for you. For your best friend, that funeral is the beginning – not the end – of a painful, dark and life-changing journey that is one of the hardest things they will ever have to deal with. As the weeks and months pass by after the funeral, you notice changes in your best friend. You might not see them as much as you did previously. You might not see their presence online as much. You might not get as many – if any – texts as was normal. You might notice that their emotions – if you get to see them – are more than just sadness. 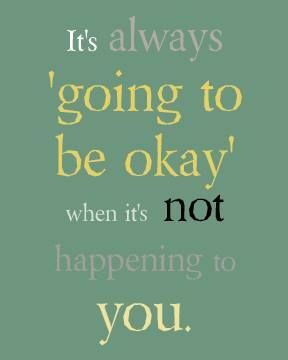 On the contrary, you might notice that when you’re around them, they always seem to be smiling and insisting that they’re okay. They’re not okay – they’re grieving. You realize that you have no idea what to say to them because you’ve never grieved before. 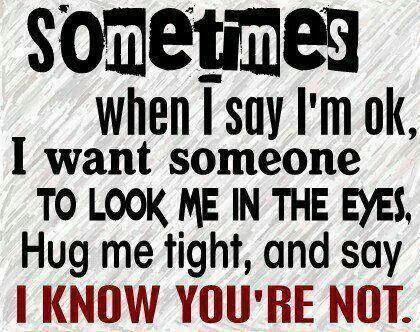 You know it’s more complicated than them just being ‘sad’, but what do you do?? You can’t ignore them because you know they’re hurting, but you have absolutely no idea what to do to help them. Most people choose to do nothing because they think that they’re ‘giving them time’ and feel like that’s the ‘safer’ course of action. Having been on the side of not knowing what to do AND having been on the side of grieving over the loss of my mother the last year or so, I decided to write this blog in the hopes that it would help those who are grieving get the emotional support that they need AND that it would help those that haven’t grieved to be able to give the emotional support to their loved ones that need it so desperately. Understand that everyone is different – so everyone will grieve differently. It’s not an exact science; this blog only serves as a guideline. Adjust as necessary for your loved one. Let’s look at what grieving is first. Grieving is not just sadness or depression (as commonly thought), but sadness and depression are part of grieving. 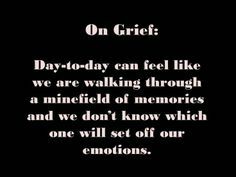 Grieving is a process that happens over time; it could be a few months, or it could take a few years. The easiest way to explain it is like the Space Mountain ride at Disney – you’re in the dark, have no idea which (emotional) twist or turn is coming next and are just along for the ride until it ends. Grief can hit at any time, too; you can be going along your days, thinking everything is fine, and then BAM – you’re down for the count for days, crying and useless. BuzzFeed posted a great article about depression that completely applies to grieving, as well. Read more here. It’s not just the sadness and depression that you experience. There’s anger, guilt, confusion, fear; just to name a few. Your self-esteem and self-confidence can be affected. Your sleeping patterns and appetite can suffer. You question your own mortality. It’s a downward spiral of thoughts and feelings, and not a very pretty one. Until you have ridden the roller coaster of grief, you have no idea of just how dark your days can be; you have no idea the maelstrom of destructive emotions that will course through your veins – and mind – and burn you from the inside. I know I didn’t. 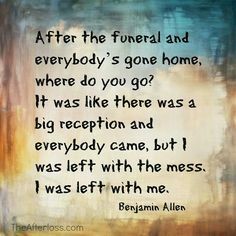 You also have other family members to deal with who are grieving as well, and often times, you see sides of them during the process that you don’t particularly like because it’s a side of them that you’ve never seen before – and they’ve never seen it, either, more than likely. Bills, possessions, wills, properties, heirs – all sorts of legal things have to be dealt with, and often, not everyone agrees on how/when to do it. I’ve learned that death changes people, and usually not for the better. People will behave in ways that you never imagined that they could. Grief is the biggest part of what causes such severe personality changes. And the less someone deals with their grief, the worse their behavior becomes. It’s truly one of THE hardest things to experience. The person you are when you go in is not the person you are when you come out. After you’ve gone through it personally, you usually have an idea of what to say to someone or how to treat those that are going through the same. 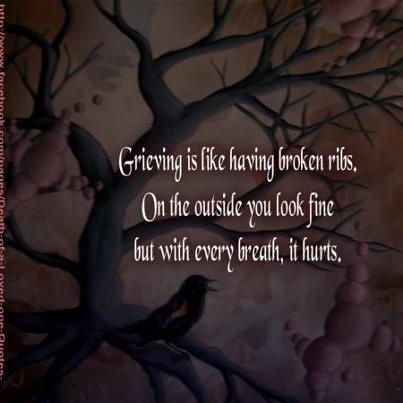 For those of you that have not experienced grieving, it creates an awkwardness that usually leads to silence. You know your friend or family member is hurting, and the last thing you want to do is say something that is going to hurt them more or sound insensitive or cliché, so you do the safest thing – you say nothing. You might think of them often, you might even pray or send out positive energies for them, but if you never tell them, they never know. To them, it’s like you did nothing. The one who is grieving is typically incapable of telling you what they need. They are too lost in their pain and downward spirals of turbulent emotions to be able to articulate the kind of support that they need to help them feel better or help them feel loved and thought of. Grieving is a lonely process to go through, and you often feel isolated from everyone. (Read my other blog The Island of Grief for more about this.) It just makes an already awful situation even more awful. I lost both of my grandfathers when I was six…I lost a cousin when I was twelve…I lost my grandmother when I was fifteen…but I had never grieved until I lost my mother. I’ve always been on the other side – that feeling awkward-not knowing what to say-just remaining quiet – side. 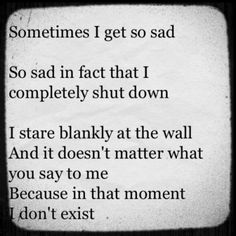 I never knew what to say when someone was grieving, so after the preliminary “I’m sorry for your loss” bit, I didn’t say or do anything else. I thought bringing it up again would be painful, so I didn’t. I assumed that maybe they didn’t want me to or that I wasn’t supposed to. I never checked to see if they were doing all right later. I never let them know that I was thinking about them. I didn’t do anything because I didn’t know WHAT to do, so I thought it was better to do NOTHING. Now I know that that was wrong. The last year and a half since losing Mom has been a very bad, very dark place for me. It’s been THE worst time of my life; let’s just say it like it is. I have also never felt more UNloved or UNthought of in my life. Does that mean that my friends and family don’t love me or hadn’t thought of me during this horrible time? Of course not! They thought of me often, and periodically when I’d post on Facebook about being in this awful mindset, they would leave a comment in response and support. But that’s not what I needed. And I know I’m not alone with my needs. I’m just one of thousands. I needed those that cared about me to REACH OUT to me on their own without being prompted. I needed a ‘thinking of you’ card to show up in the mail. I needed a text message saying ‘hey, just letting you know I’m wondering how you are’. I needed a voicemail that said ‘you don’t have to call me back if you don’t feel like it, but I know you’re hurting and I hope you’re ok’. I needed an email that said ‘if you feel like talking, I feel like listening’. I can’t tell you what those sorts of things would have meant to me. They probably would have made me cry, to be honest. I’m sure I speak for hundreds of others in this way. So why didn’t I get any of that? Why don’t any of us in that situation get what we need? Because not only can the one grieving not tell you what they need or how much they’re hurting, most of us don’t know what to say or how to treat someone grieving (if we even know they are), so we say or do nothing – it really is just that simple. After sending out a survey to ask others about their experience grieving and what they’d like others to know, I’ve compiled all the responses and made a list of 5 do’s and 5 don’ts that come ‘straight from the horse’s mouth’…a grieving one, that is. With each of these, please consider the specific person that is grieving and adjust if necessary to better fit their personality. This is a ‘one size fits most’ – not a ‘one size fits all’ – list. DO send ‘thinking of you’ cards, letters, texts, etc and more than once, if you can. Even if your loved one doesn’t respond, know that reaching out to them DID make a difference and that it DID touch them to know that someone was thinking of them. It tells them that they’re loved when they’re feeling very unloved. It doesn’t matter if it’s two weeks after the funeral or two years, send those messages of support – your loved one will tell you when they’re feeling better (and basically when you don’t need to send anymore). DO offer to listen if your loved one wants to talk about their deceased family member/friend. Tell them that specifically; don’t wait for them to mention it. Sometimes the ones grieving think that no one wants to hear about the past, that no one wants to listen to them relive memories, because it’ll be sad. (And, of course, that’s not true.) You could say “I just want you to know that if you ever want to talk about ______, I want to listen”. Your loved one will either tell you that they’re not ready, but that they will be in the future, or they’ll take you up on it immediately. 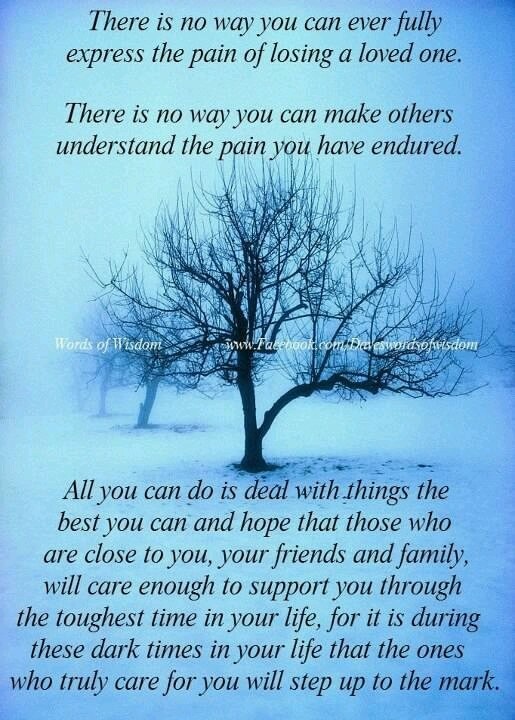 Most that have not experienced grieving think that those of us who are don’t want to talk about the one causing us the pain, but this is usually not true. If you have any special memories and/or pictures of their loved one, by all means, show them (or give them a copy of) the pictures and share those memories with them. It might make them cry, but that’s okay. It helps in their healing. It’s a happy cry, as strange as that sounds. DO offer to take them out for coffee, dessert, lunch, dinner, etc. They might say no a few times, but keep asking periodically. One day, they will surprise you, and they will say yes. The one grieving often doesn’t have the ability to do the inviting, even if they’re feeling slightly better, and they are much more likely to say yes to someone asking than to gather up the energy to do the asking. They need love, support and encouragement, but they usually can not ask for it. If you’re very close to the one grieving, like a sibling or best friend, instead of asking if you can do something for them, just do it. Cook a couple of their favorite dishes or make their favorite dessert and take it to them after calling to let them know you’re on the way. If you ask if you can do something, you’ll always be told no. If you just do it, it’ll always be accepted and appreciated. DO hug your hurting loved one when you see them and give them a big smile. Often those who haven’t grieved almost feel guilty for being happy around someone who is. This is not true. If you are happy, share that happiness. Don’t be afraid to talk about positive things that might be happening if your life. It will help ease the pain of your loved one. You will be a brief ray of sunshine in a stormy world, and it will be appreciated. Just because they are sad doesn’t mean they expect you to be. DO have an initial, direct conversation with the one grieving. Pretending that someone hasn’t died and that everything is normal won’t work. 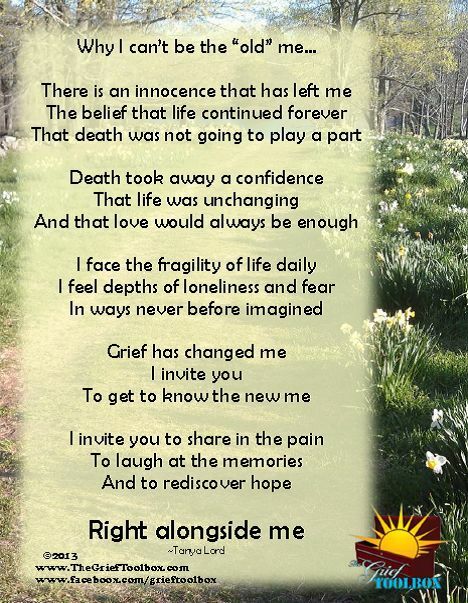 Your loved one’s life has been forever changed, and they will not be themselves for months and possibly even years. It will require extreme patience from you, and it will also require a “proactiveness” on your part that you’ve not been accustomed to. A few weeks after the funeral (because they’re in shock until at least two or three months after; sometimes longer), call them and tell them that you want to support them but that you’re not sure of how. Don’t worry about saying the ‘right thing’ – there is no right thing to say. Tell them that you will periodically check on them (in whatever way is comfortable for you), and encourage them to not be afraid to tell you if they need more support from you or less. It will change as the weeks and months pass, too, as they work through the different stages, so you might need to have another direct conversation. The one grieving will welcome the opportunity to talk to you about where they’re at emotionally and what they need from you. 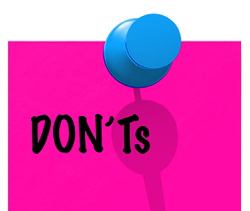 DON’T use clichés ever. They are empty sentiments and mean nothing to the person that you’re saying them to. You know the kind; “hang in there”, “be strong”, “let me know if I can do anything”, “I’ll be here if you need me” and the like (don’t misunderstand – some people truly do mean the last two, but more often than not, the statements are said with little meaning behind them). If you don’t know what to say, tell your hurting loved one just that. Tell them that you know they feel awful and that you wished you could do something to make them feel better. Tell them you want to be there but that they will need to tell you when and how. Tell them that you’ll check on them in a few days/weeks/months. Tell them that you have no idea what to do; that’s okay, too. Just be honest and mean whatever you do say. The honesty will be truly appreciated, even if you feel like you said nothing of value. DON’T ignore them. I know all of us get busy with ‘life’; sometimes it’s all we can do just to tend to our own issues. BUT, even if you only send a card or text twice in a number of months, while seemingly insignificant to you, it can make the entire day or week of someone grieving. What doesn’t seem like much to you is momentous to someone in pain. You might think of them often and hope they’re doing better and other niceties, but if they aren’t told, it’s the same to them as if you hadn’t thought of them at all. And the worst thing for someone grieving to feel – along with the other awful things they’re feeling – is forgotten. It’s debilitating. DON’T suggest for your loved one to seek grief counseling. 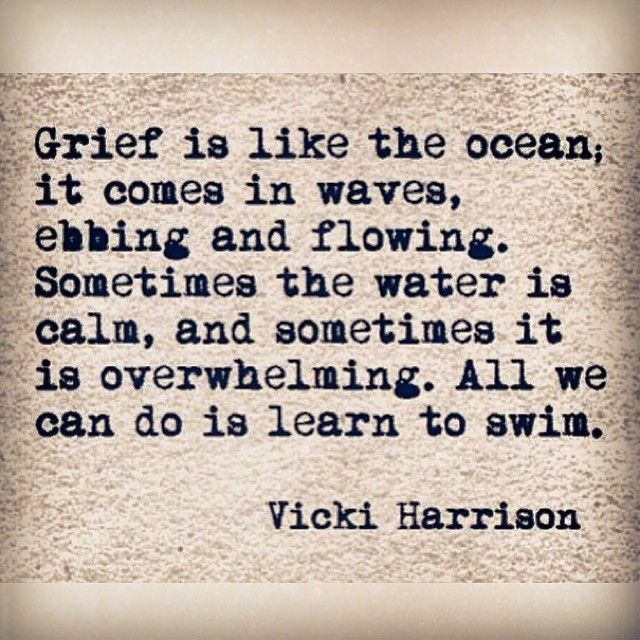 Now, don’t get me wrong here – grief counseling is a good thing, and it often does need to happen to help some people work through their grief. BUT unless you are super close to that person (sibling, best friend, child, etc), making that suggestion, especially too soon, tells them that they’re ‘too’ depressed or ‘too’ upset, and it will close them up from you. It will make them feel like they ‘should’ be happier around you or that they ‘should’ be over their grieving quicker. It makes them feel like what they’re going through and how they’re handling it is wrong – which, of course, is not what you intended at all. You have to remember that your loved one’s emotions are raw and that they are easily hurt and/or offended. 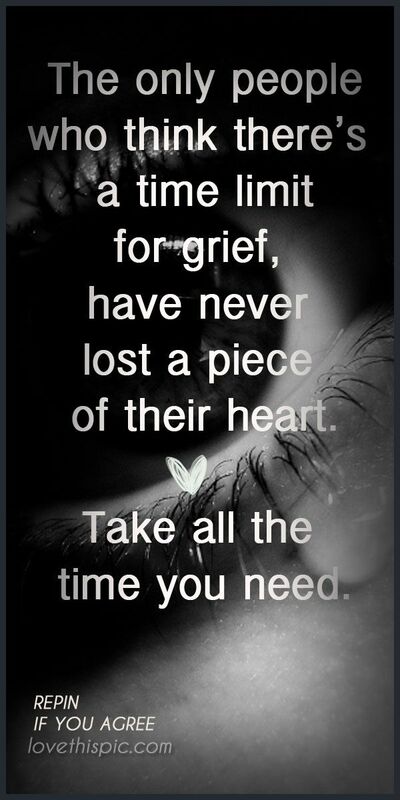 They truly might need it, but if you suggest it only a few weeks or months in to their grief, they might not contact you for some time only because they’ll feel like they’re being judged; like something’s wrong with them or that they should be ‘over it’ already. DON’T assume that your loved one wants to be left alone. Those that are grieving do need some time to themselves, of course, to cry and be angry and all sorts of other messy, emotionally draining things, but don’t assume that they don’t want to hear from you or that they’ll call you when they’re feeling better. There are some that truly do want to be left alone, and those are the ones that will tell you in no uncertain terms that they’ll contact you when they’re ready. But most people grieving are not going to tell you that. Unless someone has firmly stated so, don’t wait for them to contact you. They want space, yes, but they don’t want to be forgotten. DON’T pretend like nothing has happened. There are some folks that think the best way to handle someone grieving is to essentially act like nothing bad happened; to treat the person in the same manner as they had previously and to expect that person to behave the same as they had previously. That is a disaster waiting to happen, and it happens more with work and acquaintance type relationships more so than with close friendships and family ties. I worked in purchasing when Mom passed, and so I placed orders with and took orders from the same people month after month. I emailed one lady in particular and explained that I had been out of the office so much because my mother had passed, and she absolutely ignored me. She never offered condolences, she never acknowledged my loss and she went so far as to make ridiculous comments like “the sun is shining in ____” (whatever city she was in), and I just wanted to reach through the screen and strangle her. I wasn’t looking for a shoulder to cry on given our work relationship, but we’re still human. Loss will affect someone harshly, regardless of the relationship, and to ignore it in any situation will cause resentment and breed contempt. 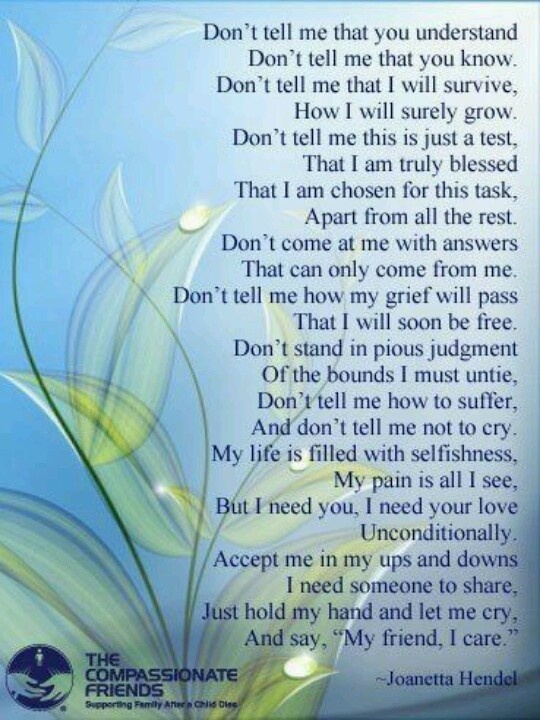 There are more that could be added to each of these lists, but this gives you a very good idea of just how to handle that grieving loved one. This blog gives you a little glimpse into their minds as to what they need and want from you. Overall, the most important thing that I can stress is to COMMUNICATE with them along the way of their painful journey. You will be a tremendous help to their healing if you do. Have other suggestions? Feel free to post them below so that others can see.